We are so excited to go to St. John next month. It is my parent’s 50th anniversary and we are fortunate enough to be staying at one of the best hotels on the island because we have all been planning and saving for years in preparation for this trip–a 50th anniversary is a big deal. We realize, however, that most families, ours included, are usually not staying in $500/night hotel rooms and eating $15 hamburgers for lunch. 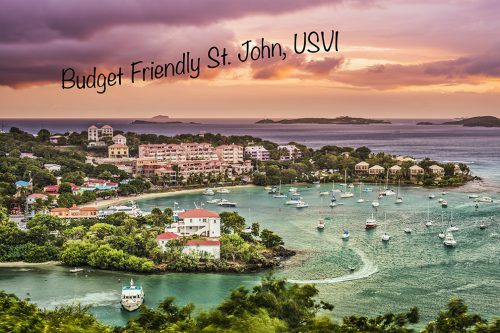 The question is: Is there are budget friendly St. John, USVI? St. John is reputably one of the more expensive Carribbean islands. Located in the United States Virgin Islands, which also includes St. Croix and St. Thomas, the island is only accessible by boat, making a flight directly to St. Thomas and then a boat ride necessary. The long travel times are worth it when you arrive, but deciding on budget friendly family accommodations isn’t easy. With a little sleuthing, however, it is possible. When looking for budget accommodations, look for what is important to you first. Is it kids clubs, an included breakfast, a family friendly beach? 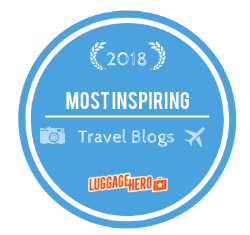 For us, on this particular trip, while the room rate definitely isn’t cheap, with a free breakfast included and a spectacular kid’s club at no extra charge, the overall room rate seemed worth it for quality time spent with extended family. 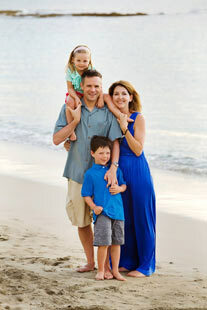 After all, how often do you go on vacation with your parents, your siblings, their spouses and all nieces and nephews? But for many families, a kid’s club and included breakfast is not as important and an overall savings is important. St. John does have several hotel options. One of the most popular options for savings is renting a family friendly villa or condo. VRBO has several options all over the island and a very popular house for large families is Eleah’s Garden. The villa has 4 bedrooms, dining and living areas, beautiful views and averages $250 per night–extremely budget friendly for a large family. This particular property is very highly rated on sites such as trip advisor. One of the most flexible and popular budget accommodations on the island are in Cinnamon Bay. Cinnamon Bay dubs itself a “budget conscious hotel alternative” and that is the perfect description for this property. Consisting of open camp sites, tented campsites with solid floors and cottages, there is plenty to choose from. The property also has a small restaurant, an adorable front desk and charcoal grills, a picnic table, ice chest and gas stove. There is also a general store. Cinnamon Bay has been around for years and is very popular year after year with repeat guests. Each “site” is private and within a few steps to the beach. Best of all, most of the cottages are no more than $90 a night and the most expensive cottage is only $160 a night even during the high season. Situated just above Cruz Bay are Samuel Cottages. With fabulous views of the bay, Samuel Cottages are three one-bedroom cottages with living rooms, kitchens and big front porches for enjoying the sunset. They are located within a 4 minute walk to town and a 15 minute walk to the beach. Tennis is also nearby. Samuel Cottages have been around since 1995. Rates run between $125 and $150 per night and children under age 12 are free. Quaint St. John Inn is right in the center of Cruz Bay in an adorable historical building. A boutique hotel with plenty of character, this inn has everything a family needs. Standard rooms, rooms with kitchenettes and suites are all offered at various rates and the inn also provides a continental breakfast. A small pool is also on the property when you want a break from the beach. The most expensive suite–a two bedroom with a kitchenette–is $290 during high season. They are also a very easy walk to the beach. Saving money on lodging is the most obvious for budget friendly St. John, but there are other ways to save money. Bring your own snorkel gear. Hotels and beach shacks charge a premium for snorkel gear rental and you can save significantly by bringing your own. As mentioned in past posts, cook your own food, whether it’s a grill at Cinnamon Bay or a kitchenette at St. John Inn, cooking your own meals saves a ton of cash. Instead of touristy restaurants, try to find out of the way restaurant frequented by locals or find a roadside food stand that locals know about. Take advantage of happy hour. There are plenty all over the island with significant savings on both food and drink. If you plan to drive around the island during your stay, consider renting a car in St. Thomas and booking the car ferry over to St. John rather than a regular ferry. It’s worth comparing prices on a car rental in St. Thomas vs. a jeep rental in St. John. Check out Virgin Islands Coupons to take advantage of any coupons or specials running during your stay.